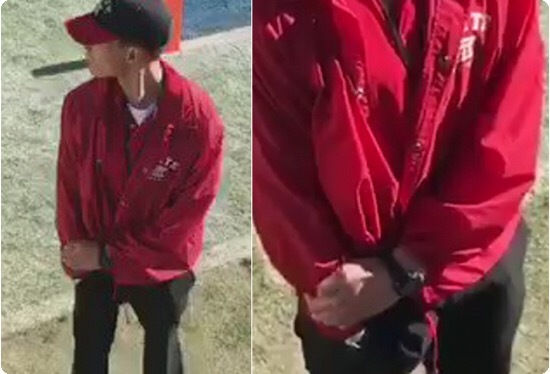 NFL Security guard gets caught yanking his chain during San Diego Chargers game. A female fan, whose name is unidentifiable, allegedly witnessed a NFL security guard stimulating himself rather vigorously on Sunday during a San Diego Chargers game in front of cheerleaders. Without delay, the fan took out her smartphone and began recording the man in action. The security guard was so engaged with his “tool” that he failed to even realize that he was being recorded. The Chargers’ front office has confirmed the guard committed an act of complete vulgarity just a few feet away from the team’s cheerleaders on the sideline. The team wrote in a statement, “The Chargers, Elite Security as well as the San Diego Police Department are aware of the disturbing actions of an Elite Security staff members at Sunday’s game. We apologize to any fans who may have witnessed the incident. Elite Security is currently investigating the incident and has vowed to take immediate and appropriate action.” The security firm has also specified its high standards stating that, out of the thousands of guards employed at NFL functions over the years, not one was ever caught pleasuring himself/herself while on duty.